Fixed resistors frustrate the flow of electrons, and are used to control voltages and current flow in virtually every radio circuit. 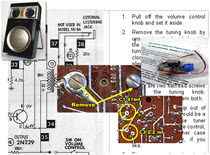 The photo shows typical examples found in old transistor radios. They are frequently stood up in compact radios, with one lead folded along the side of the resistor to save space. 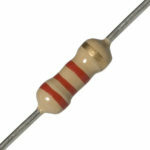 Resistors are designed to handle different amounts of power, and are rated in Watts. 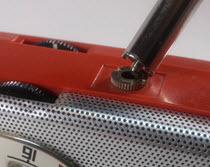 Typical transistor radios have ¼ or ½ Watt resistors. Typically, but not always larger resistors can handle more power than their smaller cousins. Resistors are also measured in ohms (Ω), or thousands (kΩ), or millions of ohms (mΩ). Their values are often represented with color-coded stripes. The first two bands indicate the first two digits of the resistor’s value, while the third band tells you the number of zeros to add. Here's what a fixed resistors look like on a schematic. The first two bands indicate the first two digits of the resistor’s value, while the third band tells you the number of zeros to add. As you can see here, brown stands for the number one, and black represents two. 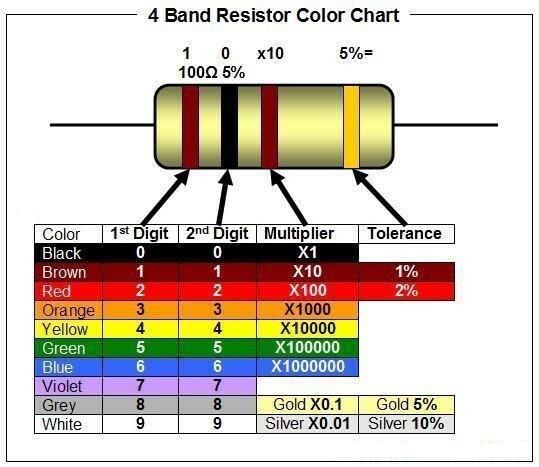 The resistor above the color chart has Red-Back-Red bands, and is rated at one-hundred ohms, or 1K ohms. 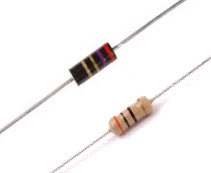 Because orange is the color for three, a red, red, orange resistor like this one would be rated as twenty-two thousand ohms, also referred to as twenty-two-K ohms. 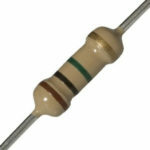 Brown is the color for one, black stands for zero, and green indicates five, so the first three bands on a one-million-ohm resistor would be brown, black and green, in that order. One million ohms is referred to as a megohm in radio parlance, so the resistor in would be a one megohm resistor. The last band on a resistor indicates how close the actual value is to the claimed value. In transistor sets the variance is typically 5% (Gold), or 10% (silver). Therefore, a 100-ohm resistor could be as low as 90 ohms or as high as 100 ohms and still be acceptable. 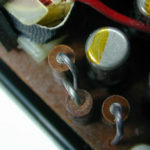 A 5% 100-ohm resistor could be between 95 and 105 ohms. Do you have tips and experiences to share? Questions? Suggested corrections or additions? Leave a comment below. I’ll review comments and post or incorporate the most useful ones. Your email address is required if you choose to comment, but it will not be shared.